2011 has arrived in a flurry of light and shadows, and with it, this release on DESOLAT X, the special edition series that features music for dance floors. This time on blue vinyl and artwork by Florian Pohl. 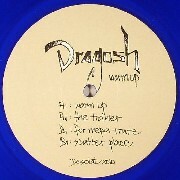 A natural at manipulating the soundwaves and musical algorithms, Dragosh has been infiltrating music software since the age of 15, based on a healthy obsession with the foundation of snare and bass. Raised in Bucharest, his roots run to house, jazz, hip hop and before that, Romanian folk and the stories intricately interwoven therein. As a budding physicist, who currently resides in Italy, we’re sure you’ll agree Dragosh’s work embodies the elusive hunt for dark matter within the curvature of spacetime: disembodied and floating. Afterdark antigravity vibes never felt so good.